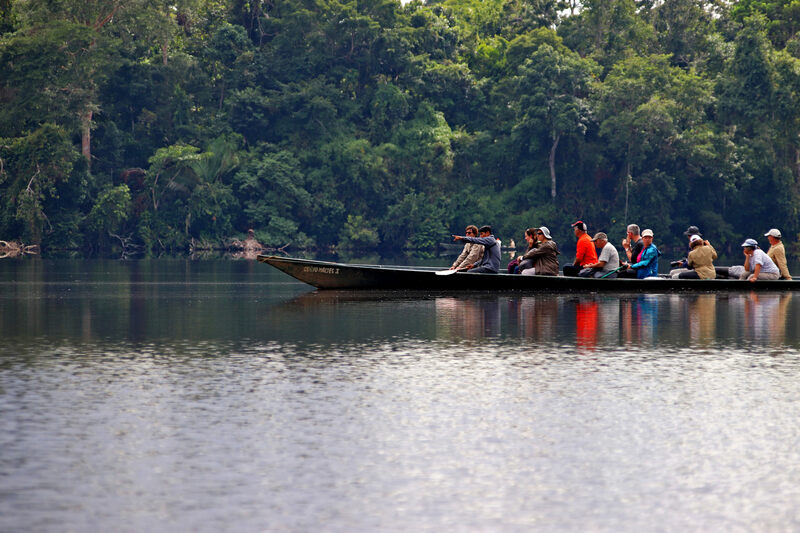 Protecting tropical forests is essential for achieving the climate goals of the Paris Agreement. Global Forest Watch Climate recently released estimated carbon dioxide emissions associated with the 2017 tropical tree cover loss data, and the numbers demonstrate more of what we already knew. If tropical tree cover loss continues at the current rate, it will be nearly impossible to keep warming below the pledged two degrees Celsius (3.6 degrees Fahrenheit). Below are five numbers that demonstrate just how important tropical forests are in preventing further climate change, and how much more visibility they need on the global climate change mitigation agenda. 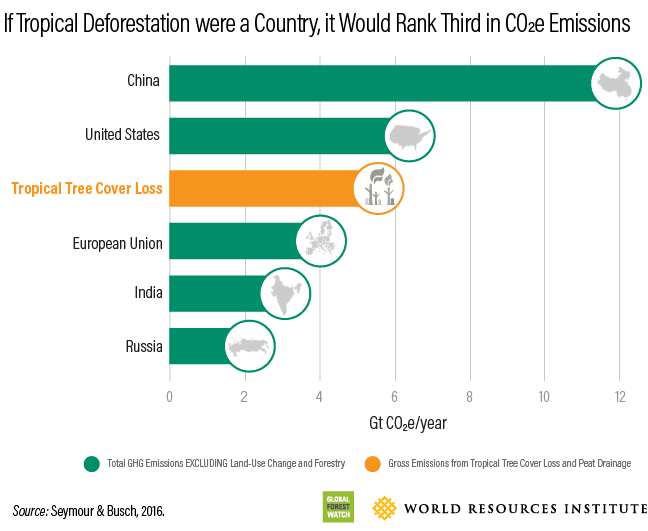 If tropical deforestation were a country, it would rank third in carbon dioxide-equivalent emissions, only behind China and the United States of America. 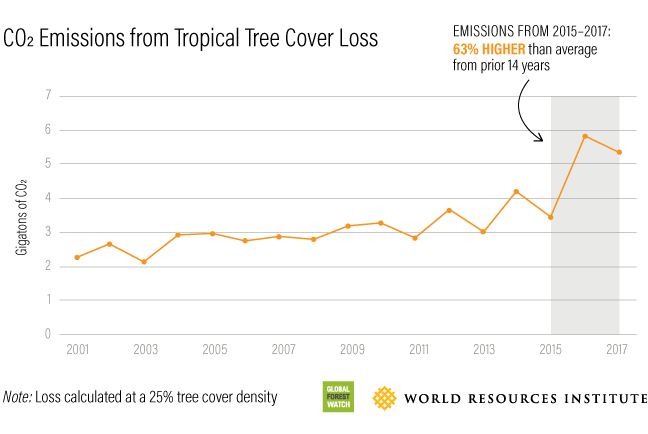 Annual gross carbon dioxide emissions from tree cover loss in tropical countries averaged 4.8 gigatons per year between 2015 and 2017. Put another way, tropical tree cover loss is now causing more emissions every year than 85 million cars would over their entire lifetime. It's getting worse. Average annual emissions in the last three years were 63 percent higher than in the preceding 14 years. Across all Nationally Determined Contributions (NDCs) under the Paris Agreement, forests represent a quarter of all planned emission reductions by 2030. Although the rate of tree cover loss declined in some places, the most recent data for 2017 suggests that many countries are moving in the wrong direction to fulfill these goals. Average emissions from 2015 – when the Paris Agreement was signed - through 2017 were 63 percent higher than the average over the 14 years prior (3.0 gigatons per year versus 4.9 gigatons per year). Global Forest Watch's annual tree cover loss data provides an unbiased proxy for which nationally-reported estimates of tropical deforestation can be assessed. GFW Climate builds on this global dataset to estimate associated carbon emissions from aboveground biomass clearing. It's not just carbon in the trees that make forests important for climate. Forests hold critical local cooling power – to the measure of more than 2 air conditioning units per tree. Beyond their role in the global carbon budget, forests also have an important role in regulating climate at a local level by shading the ground and transpiring water. Every 100 liters of water a tree transpires (just a fraction of what many trees release each day) provides the equivalent of running 2 central air conditioning units for a day (the cooling equivalent of 70 kilowatt-hours of electricity). On the other hand, deforestation can increase local air temperature in the tropics and temperate zones by one degree Celsius (1.8 degrees Fahrenheit) and increase daily temperature variation by almost two degrees Celsius (3.6 degrees Fahrenheit) in the tropics and 2.85 degrees Celsius (5.13 degrees Fahrenheit) in the temperate zone. Tropical forests are 8 percent of the problem but 23 percent of the solution. About 8 percent of global emissions currently come from tree cover loss in tropical forests, but these same forests can provide 23 percent of the cost-effective climate mitigation needed before 2030. NDCs still fall far short of the total mitigation needed to keep 2030 emissions in line with a two degrees Celsius scenario, and about 7.1 gigatons of carbon dioxide can be mitigated annually through the management, protection, and restoration of tropical forests, mangroves and peatlands. That's equivalent to the total carbon dioxide-equivalent emissions of Russia, the European Union and Japan combined in 2014. This potential comes from the avoided emissions through stopping deforestation and degradation as well as the removal of atmospheric carbon that takes places through forest growth and restoration. Forests receive just 3 percent of available climate mitigation finance. 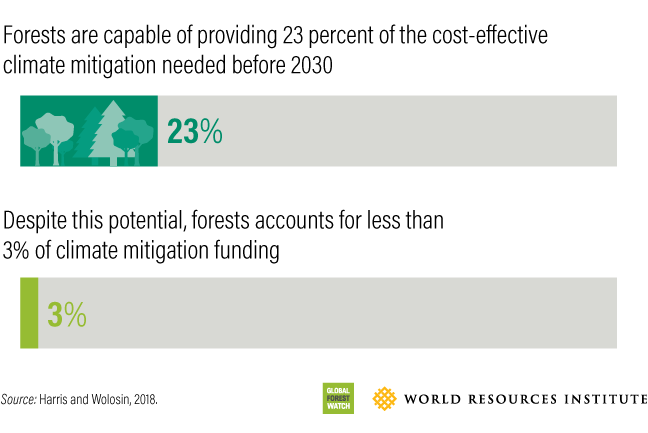 Despite this potential, forest-related finance, even for countries with high rates of deforestation, accounts for less than 3 percent of global climate mitigation-related development funding. To reach global climate goals it's critical that national and local actors alike double down on the proven strategy of reducing deforestation to mitigate climate change.